Even in our endeavour to remain steadfast in the light of Christ we will often fall into moments of darkness. Hold on firmly to His cloak and He will lead us out. For Jesus is truly the light of our World! In our struggle to serve Him faithfully, He continually prompts us and leads us closer to Him. Till one day soon we will meet Him face to face. O Blessed Mother who knows the depths of our hearts. Purify our minds and hearts so that we can serve Jesus your son and our Lord faithfully. But when anyone does obey what he has said, God’s love comes to perfection in him. We can be sure that we are in God only when the one who claims to be living in him is living the same kind of life as Christ lived. and what is being carried out in your lives as it was in his, is a new commandment; because the night is over and the real light is already shining. is still in the dark. But anyone who loves his brother is living in the light and need not be afraid of stumbling; unlike the man who hates his brother and is in the darkness, not knowing where he is going, because it is too dark to see. 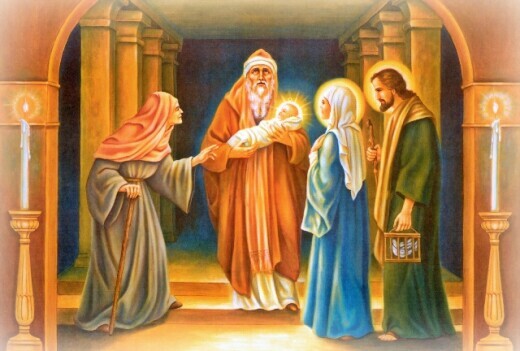 As the child’s father and mother stood there wondering at the things that were being said about him, Simeon blessed them and said to Mary his mother, ‘You see this child: he is destined for the fall and for the rising of many in Israel, destined to be a sign that is rejected – and a sword will pierce your own soul too – so that the secret thoughts of many may be laid bare.